Turns out working full time while going to graduate school is challenging. One of the articles we discussed in class tonight was about New York Jews and Chinese Food. I got home around 8:00 with Chinese food on the brain and a determination to cook some of the vegetables that were rapidly deteriorating in my crisper. Add a couple of tablespoons of oil to a wok or sauté pan over medium heat. (I opted for a tablespoon of canola oil and a tablespoon of chile oil.) Add the leeks, stirring frequently until they start to brown. Toss the turnips in and continue stirring until they have softened. Slice your rehydrated shiitakes, add them in and keep cooking. Add the tofu, vinegar, soy sauce, Sriracha, sesame oil, ground peppercorns, chicken stock/bouillon and the liquid left from your mushrooms, stirring to combine. Let simmer stirring occasionally until your rice is done. Toss the chopped parsley or cilantro in at the last moment. I had planned to eat this accompanied by a Brooklyn Pilsner that had mysteriously appeared in my refrigerator. But, by the time I sat down to eat, the beer had just as mysteriously disappeared. * See A Salad for Sailing for a brief discussion of this most excellent technique. 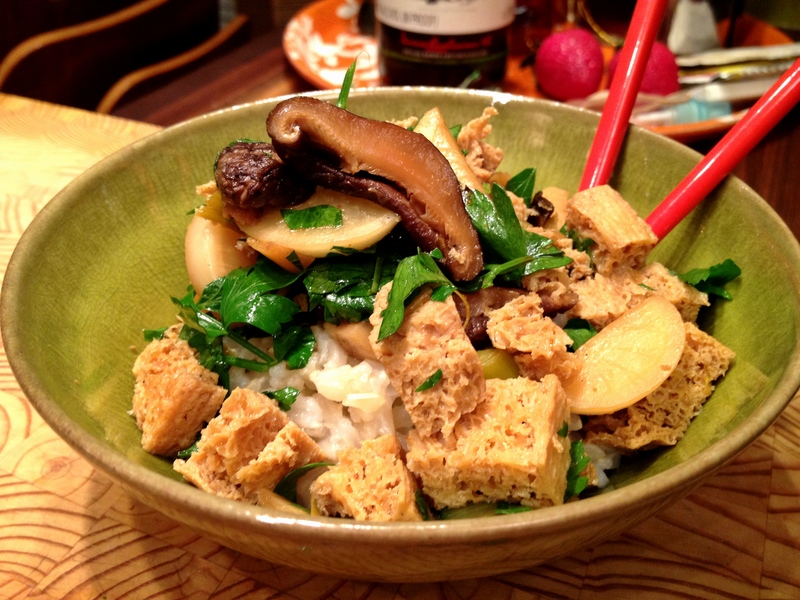 This entry was posted in main courses, vegan, vegetarian and tagged Chinese, leeks, mushrooms, shiitake, tofu, turnips by Jasmine Nielsen. Bookmark the permalink.